The scoubidou does not need to cover the entire strap. 1. 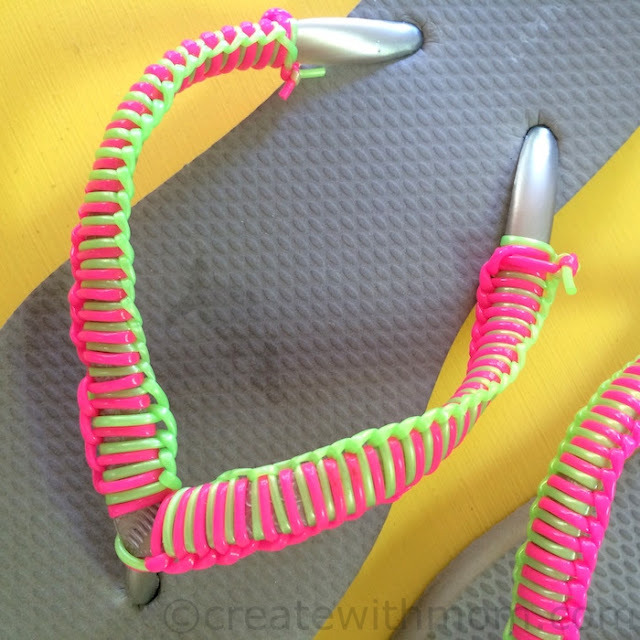 Line up the two different colour strands of scoubidou and fold them in half. After folding in half tie the strands around the flip-flops toe divider so all four ends are the same length. 2. Starting with the right strap, take one of the strands and loop it from the right side, behind and around the strap, then down through the loop. Pull the knot tight. 3. Now take the other strand, which should be the other colour and loop it from the right side, behind and around the strap, then down through the loop. Pull the knot tight. 4. Repeat steps 2-3 to cover the strap. Try to keep your knots even. 5. When you have about 2 inches (5 cm) of scoubidou, make your last knot on the right side. Then bring the strand from the left side over the strap and tie it to the other strand. 6. Tighten that last knot so it rests against the bottom edge of the strap. Cut of the excess scoubidou. 7. Now you're ready to wrap the left strap. Start with the colour you looped first on the other strap. Loop the strand from the left side, behind and around the strap, then down through the loop. 8. Take the other strand and loop it from the right side, behind and around the strap, then down through the loop. 9. Repeat steps 7-8 until you have about two inches (5 cm) of scoubidou, make your last knot on the left side. Then bring the strand from the right side over the strap and tie it to the other strand. Cut of the excess scoubidou. 10. 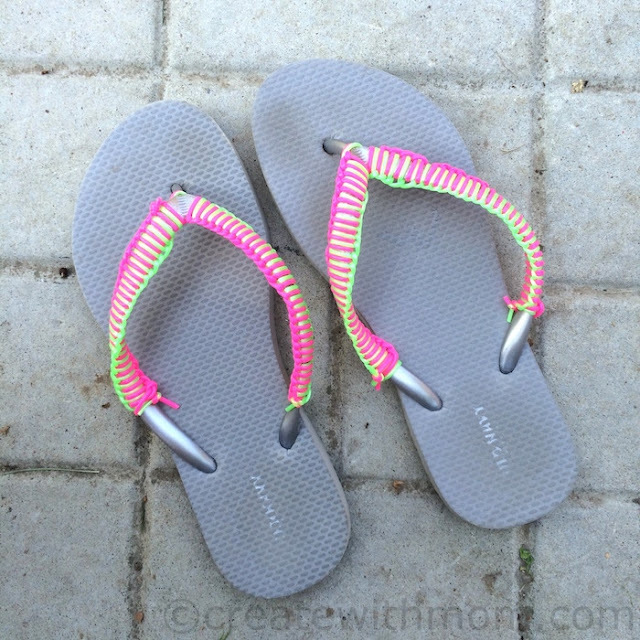 Repeat steps 1-9 for the other flip-flop so both sides are laced up. These are so cute! What a great DIY idea! Much cuter than the originals! this post totally takes me back.....summer camps, and after school days at the community centers, we always had a fun time with Gimp! I still have key chains that were made. Good times! Neat idea, wish I could wear flip flops.